Meg-a Metallic Shine and Finish! Green is one of those colors that makes me smile and, of course, reminds me of spring. 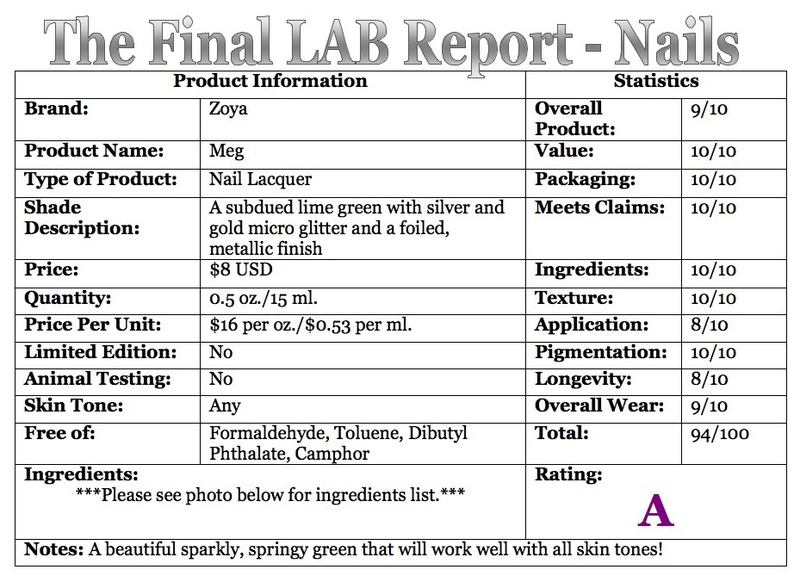 Zoya Meg Nail Lacquer ($8 USD for 0.5 oz./15 ml.) is described as a “light yellow-toned mermaid green with heavy gold and silver metallic shimmer and a sparkling foil finish. A light and fresh looking green with added sparkle and shine.” To me, it looks like a subdued lime green with silver and gold micro glitter and a foiled, metallic finish. At first glance, this color looks slightly warm, but the mixture of gold and silver glitter with this light green adds dimension, making it suitable for all skin tones. Given the texture is neither thick nor thin, Meg applied evenly and opaquely in two coats. Zoya’s website states this color’s intensity as a 5 (1 = sheer – 5 = opaque). If you are in a hurry, you could get away with applying one thick coat. Although application of this color was effortless, removal was a little more difficult. Nail polishes with ample amounts of glitter require a little more patience and a little more remover. My experience with Zoya’s lacquers is they last at least seven days with just minor tip wear and no chipping. Meg wore well for the seven days I tested it. I did notice a minor chip on my finger after the forth day, but the rest of my fingers only displayed tip wear after seven days. I used Zoya Anchor and Zoya Armor for my base and top coat. I hope everyone is having a nice Sunday. Here are this week’s coupons and sales. Happy Shopping! CoverGirl Buy one, get one 50% off ALL Face, Eye, Lip, or Outlast Nail. Limit 6. L’Oreal Spend $10 on Color Riche Lip or Nail, get $3 Extra Bucks. Maybelline Spend $10 on Eye or Lip, get $3 Extra Bucks. Neutrogena Buy one, get one 50% off Grapefruit or Blue Line Cleansers. $2 instant coupon for Beauty Club members. Rimmel Buy one, get one 50% off ALL. $1 instant coupon for Beauty Club members. Sally Hansen Spend $10, get $5 Extra Bucks. Almay Buy one, get one 50% off ALL. Aveeno Buy one, get one 50% off ALL skin care. CoverGirl Buy one, get one 50% off ALL. Spend $15, get $5 Up Reward. L’Oreal Buy one, get one 50% off Face Makeup. Spend $25, get $10 Up Reward. Maybelline Buy one, get one 50% Shadows and Liners. Maybelline $5.99 Voluminous Express The Falsies Mascara. Physicians Formula Buy one, get one 50% off Eye or Concealers. Wet ‘n’ Wild $0.69 items regularly priced $1. Almay Buy one get one 50% off ALL. Get $2 off with card. CoverGirl Buy one, get one 50% off ALL. L’Oreal $6.99 Eyeliner or Mascara. Olay 20% off Total Effects, Complete Moisturizers or Treatments, Smooth Finish Facial Hair Removal Duo Kit. Keep reading for more information! Many, if not all of us, strive to save money, and shopping for beauty items should not be an exception. As I try more and more products from drugstore brands (and get a little older and wiser), I realize it is not always necessary to spend oodles of money for high quality cosmetics. You can find an abundance of impressive products, at affordable prices, in your local pharmacy. I review many products from high-end or luxury brands. I also realize not everyone chooses to spend their money on prestigious brands, for whatever reason. It is important for me to provide you with enough information so you can choose the best products for you, no matter what your beauty budget is. EVERY WEEK stores such as Rite Aid, CVS, and Walgreens, etc. offer discounted prices and rewards for beauty products. With a few exceptions, you should never have to pay the manufacturer suggested retail price for drugstore cosmetics. With a little bit of research, patience, and some delayed gratification, you will be surprised at how much money you can pocket. The consumer advocate within me is itching to come out! 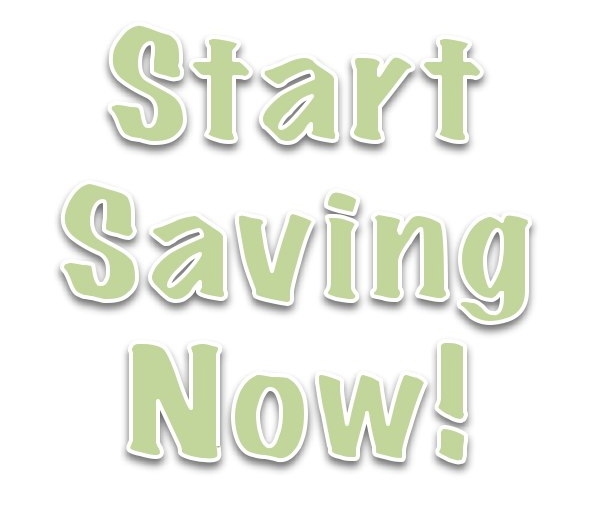 By reviewing products found at your local drugstore, and providing weekly information on store sales and coupons found in your local newspaper, I am going to help you save money so you can use it towards other parts of your life you deem necessary (maybe even use your savings towards that luxury product you’ve been lusting after!). Disclaimer: TheLABofLuxury cannot guarantee the information provided in this post is accurate. Sales, prices, and coupons may vary in certain areas. I will update information as it becomes available. If you have any questions, please feel free to contact me. Disclosure: TheLABofLuxury is not affiliated with the retailers mentioned in this post. Not the Primer it Once Was! It is almost heart-breaking for me to have to update this review. About a week, or so, ago I repurchased my favorite foundation primer, noticing some labeling changes on the packaging. I expected there would be changes to the labeling to comply with new FDA regulations regarding products with sunscreen. It was not until yesterday that I noticed the formula has been drastically altered. What was once a Holy Grail product for me, is now a good moisturizer with SPF 50. What really hurts the rating of this product is the brand’s claims. It no longer contains the ingredients that curb oil breakthrough, prolonging the longevity of your foundation. This cream is not oil free, no longer has Zinc Oxide (a beneficial ingredient for those with sensitive skin and/or prone to breakouts. ), and will not leave your skin with a matte finish. Instead, this leaves a slick (but not really greasy) look. I would not recommend this product for individuals who have very oily skin. 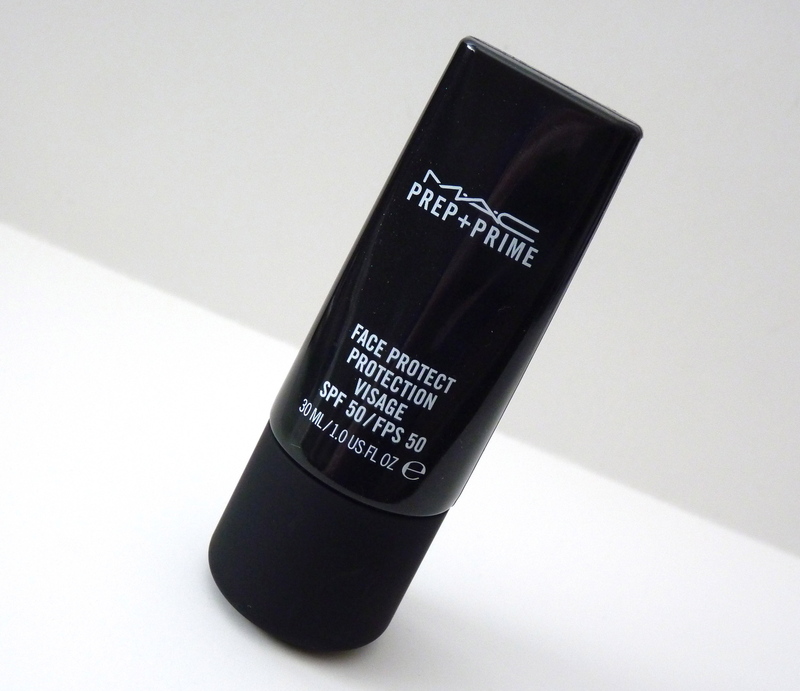 I re-tested this product with a foundation that dries down to a matte finish, but my skin did not look as matte as it did with the previous Prep + Prime Face Protect formula. After four hours, my nose became slightly oily, and was noticeably oily after 6.5 hours. Also, my foundation did not apply as smoothly as it once had, and when I blotted my nose and chin, a good amount of product transferred to the tissue. Again, I did not experience these problems with the previous formula. With the exception of the areas where I blotted, at the end of the day, my foundation was still intact and looked nice. Luckily, the addition of active ingredients such as Avobenzone (and others) gives your skin broad-spectrum protection (protection against UVB and UVA rays), which does ebb against signs of aging, discoloration, and dryness. This also contains a fair amount of antioxidants, which also prevent signs of aging. Lastly, it is still a lightweight formula that does absorb quickly. 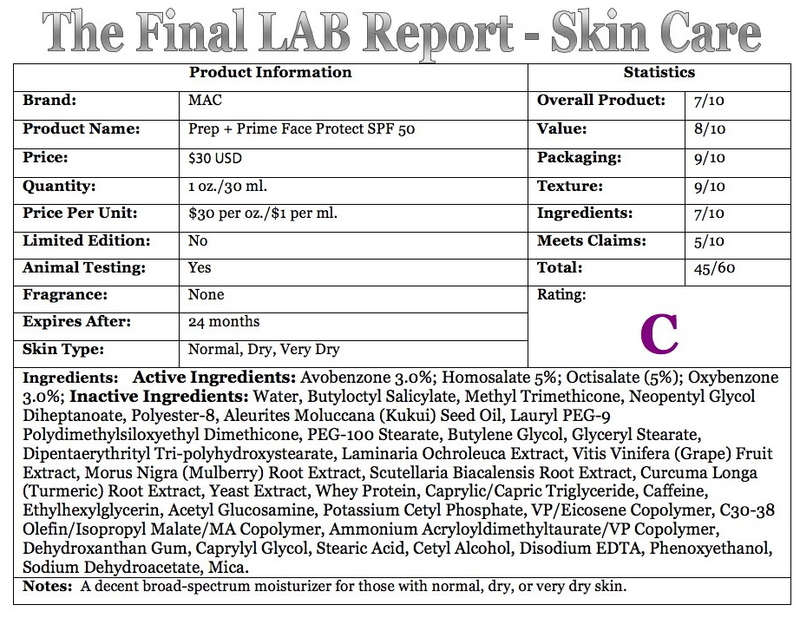 MAC does receive points for those claims, and for their anti-aging and sun protection declarations. Personally, I’ll save this product for days when my skin is feeling dry. With the warmer months quickly approaching, and my skin starting to become oilier, I will be on a the prowl for a mattifying foundation primer. This is a prime example of false advertising, something MANY cosmetic companies are guilty of (particularly with skin care products). MAC either needs to change their inflated description of this product, or re-market this as a sun-protective moisturizer for normal, dry, or very dry skin. If the company did so, it would be rated much higher. 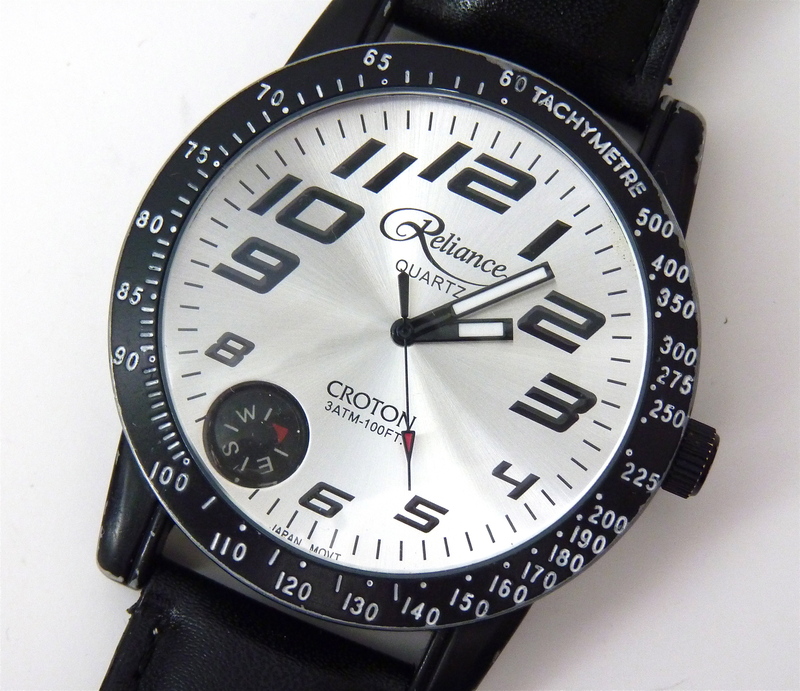 To see my previous review of this product, please click HERE. Time flies when you’re blogging! Anyone-a CEO, teacher, mother-will tell you a major component of being successful is time management, and being a blogger (whether as a career or hobby) is not any different! As a beauty blogger, I have to ensure I allow myself enough time to fully assess products. Testing the majority of products only requires eight hours or less of wear time, but long-wearing products sometimes need 12, 14, or even 16 hours. The great part of examining beauty items is having the ability to wear multiple products at the same time, and other than the occasional glance in the mirror (sounds a little vain, I know!) and noting how cosmetics are wearing, it does not interfere with the rest of my day. It really is the best form of multitasking! The downside is making sure I slap the products on early enough so I am not up at 2:00 AM waiting for a product to crease, fade, smear, smudge, or whatever else it decides to do. Photographing products and swatches takes precise planning as well. So far, I have found my best photographs are taken in indirect, natural lighting. The area I snap shots is exposed to this type of lighting only between the hours of 11:00 AM and 2:00 PM. Eventually, I would like to invest in studio lighting, but until then, timing is key. Aside from the time it takes to photograph, apply, and wear products, it takes me an average of two to three hours to compose a single blog post. This includes editing photos, writing and editing text, and formatting the entry. Sometimes it can take a little longer, particularly if I am having difficulty coming up with the right words to describe a product, but it certainly is not something that can be accomplished in 15 minutes. I write in the evenings and on weekends, but again, I have to make sure I organize enough time so I am not awake too late. Through this process, I have developed deep admiration for those who post on a daily basis. I started writing knowing it was going to take time, but I did not realize how important time management would become. As with any career or hobby you take pleasure in, blogging is a labor of love. I would love to hear how you have found ways to be more efficient. Also, what would you like to work into your day that you just cannot seem to find the time to do?